I think this title pretty much says it all. If you’re a Christian who’d like to learn more about Zen and potentially include some Zen teachings in your spiritual practice, you’ll probably like this book. If you aren’t, you probably won’t. "people of divergent faith backgrounds who choose to practice Zen to enhance their own devotional orientation.. . I have come to understand what matters most is that we listen to one another, not as adversaries but as compassionate people bringing gifts to one another to help us each discover our still unrecognized possibilities." 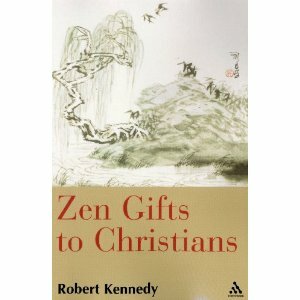 In each chapter of Zen Gifts to Christians, a “gift” of Zen (for example, Self-Reliance, Self-Mastery, or Compassionate Service) is illustrated through one of ten ancient Chinese ox-herding pictures, which Kennedy connects to Christian teachings as well as a variety of western cultural references. For example, the discipline required in sitting zazen is compared to what’s needed to become a master singer, dancer, or golf player. Kennedy also quotes extensively from poets ranging from Emily Dickinson to Mary Oliver. imagine ourselves meeting each other, bringing gifts, bringing news.